We are all connected. The last four words of the previous article in this series (from Connectivity — Back to Physics Class). “We are all connected.” What do you think that really means? Let us explore this question by first asking some other questions. Why is the telegraph and Morse code not in use anymore? At the time of its discovery, communication was taking place slowly. Over long distances it sometimes took weeks or months to reach its intended eyes or ears. With the advent of the telegraph that all changed, for the better. Why is the Geocentric model of our solar system no longer in use? At the time of its formulation, every day and night the sun, stars, moon, and visible planets appeared to revolve around the Earth, so it followed that the Earth was the center of everything. Navigating the vast seas could be done precisely with this model and seafaring trade captains and sailors soon realized they actually would not fall off the edge of a flat Earth or limited seas. The telegraph and Geocentrism both served mankind well and seemingly true, so why abandon them? These old paradigms were no longer useful because humanity, more specifically human ingenuity, research, successful experimentation and modified hypothesi were able to flourish and discover they simply were untrue. A closer look at these two historical events, however, reveals that one was widely embraced in a short period while the other took 1,200 years. Imagine where this world would be had the Authorities of Truth and Death lost their mass appeal when Copernicus, Galileo, and Kepler first presented the right Universe? 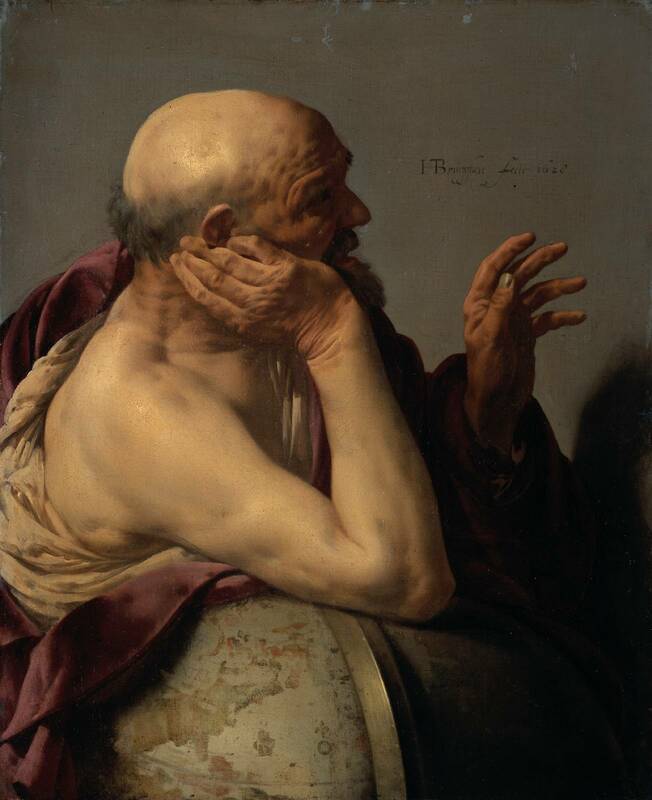 Heraclitus is often considered one of the founders of Metaphysics and perhaps to an extent Quantum physics. Going against the mainstream of his contemporaries, he said “You cannot step into the same river twice, for fresh waters are ever flowing in upon you.” For the time, his claims were radical and challenged the establishment. Another fascinating philosophy of Heraclitus was that of observer upon the nature of opposites. It was his belief in the “unity of opposites”. One cannot exist without the other, especially from the standpoint of the observer. This type of debate, speculation, and reformation was welcomed right up into the early 4th century C.E. when everything changed. From about 2000 BCE to 400 C.E. commonly known as the Classical Era, there were two fundamental belief systems competing for the hearts and minds of mankind. These opposing groups have been described in religious and historical texts in different forms. One group taught doctrines of unity and wholeness of the world and cosmos. The other taught doctrines of separation, classes or a caste system, and depravity. The former embraces a multiverse where existence is simultaneous in parallel coexisting dimensions. The latter embraces a universe, or monoverse if you will, where existence is dependent on another “force” and we control or have little influence upon it. One is a participator/activator, the other is merely an observer/receptor. Care to guess which group won out? A few other fundamental sub-groups spawned from this system as well, amplifying the divisions and destruction upon humanity. Exclusivity, or elitism, has been one of humanity’s worst undercover killers. This lethal or potentially lethal mentality stems from a belief-framework of separation — separation from each other, or separation from creation/creator. This mentality is sometimes subtle in where or how it exists, so allow me to elaborate. Intolerance of differing beliefs or lifestyles is always accompanied by harmful action. How many various examples of intolerance do we witness today? How many various examples can we recall throughout recent or ancient history (Sept. 11th, 2001 and The Trail of Tears of the Cherokee nation to name just two)? Don’t be fooled. Merely considering followers of other religions to hold invalid beliefs, considering them “lost” or deluded, or assessing their behavior as immoral or heretical is nothing more than exclusivism. If you are in the least hyper-sensitive about your personal communal religious beliefs, then you may consider stopping here and read no further. I am going to point out specific passages in the Christian New Testament that clearly promote exclusivism, and potential-probable intolerance. Keep in mind that anyone can find these underlying teachings in many of the world’s major religions; the Christian New Testament is one example and not being singled out. But for most of Western Civilization — the birthplace of modern Quantum Mechanics — it must be pointed out as no longer useful. There are perhaps three ways to interpret this passage. One, conservative Christian ministers and apologists accept this passage for face value. All non-Christians will after death be unsaved from the expected/accepted eternal damnation of a place called Hell. These verses have inspired missionaries, through hope and fear, to go into pagan non-Christian corners of the world to win converts. The passage implies not only eternal punishment for non-Christian believers, but more profoundly an intolerant God of any other belief systems. Second, many religious liberals might reject such a literal interpretation of the passage. They could argue that a baby born in India or Arabia has a very likely chance of becoming a non-Christian adult — in other words, a Hindu, Muslim, or Sikh. In modern Israel the chances of a baby becoming Jewish are around 99% not Christian. According to the Apostle Peter and the Christian New Testament, trusting Jesus as Lord and Savior as the only route to eternal bliss, then a very large majority of the earth’s population will remain unsaved. After their death, they will be tortured in Hell for all eternity without hope of mercy, for the simple reason that they followed the religion of their parents and community. Many Christian liberals consider such a destiny to be incompatible with the concept of a loving and just God. Thirdly, the Roman Catholic Church today takes a more moderate position on the matter: even though followers of non-Christian faiths do not accept Jesus Christ as their Savior, it is possible for them to receive salvation by following their own religion. However, this “new” mercy (presumably handed down from God to the Pope and his holiest bishops) does not extend to individuals who have been raised as agnostics or atheists, or have converted to unGodly beliefs such as agnosticism or atheism. To say it another way, those who do not conform at a minimum to a monotheistic tradition such as Judaism, Christianity, or Islam will suffer eternal damnation. The Apostle Paul teaches just as much exclusivity as Peter. Paul wrote that Gentiles worshipped devils. Today, those would be called Satanists, Black or White witches, occultists, or wiccans. Paul makes it clear that the Gods and Goddesses of other religions are actually demons. Christians are to completely isolate themselves from non-Christians, not even dine at the same dinner tables. “Be ye not unequally yoked together with unbelievers: for what fellowship hath righteousness with unrighteousness? And what communion hath light with darkness?” (II Corinthians 6: 14). Paul requires his followers to separate from “unbelievers“. He teaches his weak-willed followers to avoid close relationships with non-Christians. He implies that non-Christians are automatically unrighteous. He associates Christianity with “light” and all other religions with “darkness“. Paul teaches that duality cannot coexist. The Apostle Paul would be laughed at among modern quantum physicists. Paul apparently has a tendency for anti-Semitism. He clearly blames the Jews for murdering Jesus. Christian theologians today and Roman historians alike, feel that Jews had little to do with Jesus’ execution. Jesus’ aggravated assaults in the Jerusalem temple, and verbal abuse toward the Jewish priests would have been considered an act of insurrection by Roman authorities, and made him eligible for Roman crucifixion. This falls in line, according to modern Roman scholars, with the Apostle Paul being previously well acquainted in Roman society, even a Roman citizen with all its amenities, prior to meeting Jesus on the road to Damascus. There are several other clear indications that the Christian New Testament supports exclusivity. The first passage above (John 14: 6), it has been one of the main biblical passages of all Christendom used to devalue non-Christian religions or belief systems. Its meaning and implications cannot be misunderstood in the least: the only way to eternal bliss both here in this life or the next is through belief in Jesus and his teachings from the canonical Christian New Testament. In the second passage (Galatians 1: 9), Paul simply curses any teachings that deviate from his own. What many amateur Christians are unaware is that during the first two centuries C.E. (or in Catholic terms A.D.) there were three main Christian movements. This should be no surprise at all to modern inquisitors of faith-choices. Try to count all the various types of Catholic or Protestant churches available today, and you will spend the better part of a year or more researching their differences! In 1st and 2nd century Jerusalem though, there were the Pauline Christians, who were pitted against the Gnostic Christians, and Jewish Christians, and any others. More often than not, a city in that part of the Roman empire would have three or more Christian groups, each teaching very different doctrines. Paul obviously proclaims not only HIS version of Jesus, but just as much his Graeco-Roman background. In the third passage above (Acts 10: 44-45), Peter is publicly speaking to a mixed group of Jewish Christians and intrigued Gentiles. A number of the Gentiles were “filled with the Holy Spirit.” Jewish Christians were bothered by this because they felt the message was strictly for them. They viewed Jesus’ teachings were merely a reform movement within Judaism, and not pertinent for non-Jews. With the last passage (Acts 11: 1-3), some Jewish Christians argued with Peter for associating with non-Jews and eating with them, which was common during the time. Before the Graeco-Roman teachings of Paul became mainstream in 325 C.E., Jewish Christians viewed Jesus’ reformations as teachings for them only. 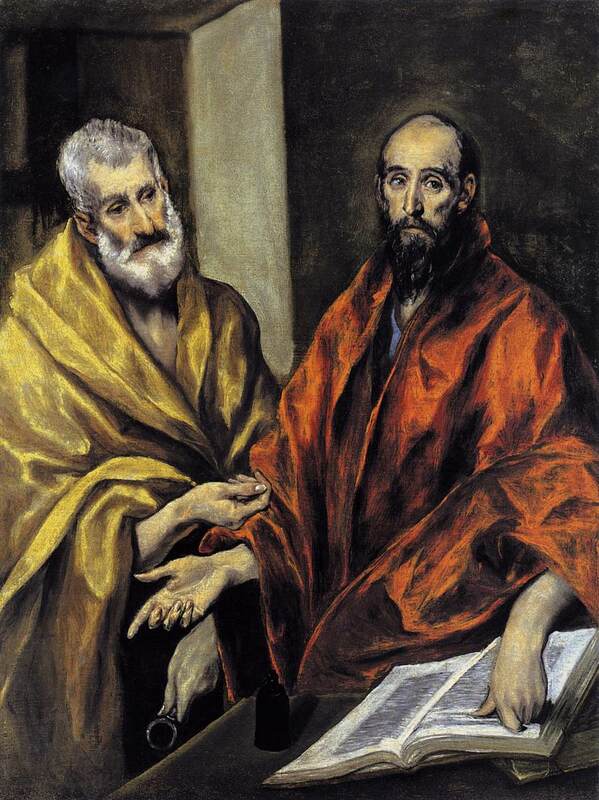 Peter persuades many of them that it is the will of the Holy Spirit to also reform the Gentiles. Nonetheless, the seven New Testament passages I have shared here are only a small portion of the many, many passages throughout the entire Bible — Old and New Testaments — that promotes separation among mankind, or elitism, or exclusion from creation/Creator. Connectivity — The New Paradigm…Finally! Fortunately, with the help of modern quantum physics and unified field theory, the old paradigms are seeing their last decades. This is more evident as the world’s cultures and nations gradually become more literate and can grasp, at least in basic terms or better, what these collective physicists and scientists are proving. Examine the world literacy map (left). It shows that much of the population is educated. 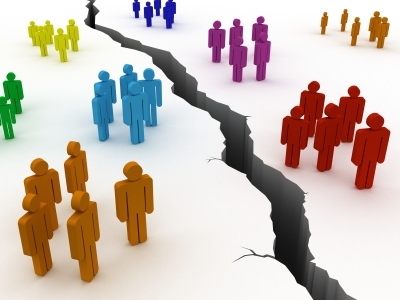 As this rate continues to rise over time, barring the militant illiterate regions exterminating much of humanity’s rise to mental and spiritual brilliance, the outcome will be that mankind requires a completely new framework of unity, of oneness, not separation. Let me be more precise; not religious separation. You may think that Carl Sagan’s revelation is far-fetched. Yet, already many renown scholars of mathematics and quantum physicists are in agreement: the existence of a web of energy connecting our physical world and our bodies to everything in the universe/multiverse suggests an entire overhaul of life as we have perceived it the last sixteen centuries. John A. Wheeler, a theoretical physicist at Princeton University and colleague of Albert Einstein, is credited for mentoring some of America’s most accomplished scientists of quantum mechanics today. Einstein believed that mankind had little influence on our environment, on our universe as a whole and that we were simply spectators. However, the late John Wheeler and his protegés today offer a radical departure from Einstein’s commonly held system. “We are participators…” Wheeler explains, “in bringing into being not only the near and here but the far away and long ago. We are in this sense, participators in bringing about something of the universe in the distant past and if we have one explanation for what’s happening in the distant past why should we need more?” Light (or the energy of light) travels to our eyes and skin by billions of interacting particles between us and our Sun, or light bulbs, or fires, whatever the source. If Wheeler is correct, then we are each creators of our reality and as we understand our world, the 7 billion inhabitants on this planet collectively manifest life itself! Quantum physics is supporting Wheeler’s idea too. Are things able to travel faster than the speed of light, and can they be in two places at once? And if things have this ability, what about us? In addition to proving a unified field, an energy web connecting everything, quantum research is showing that the connections exist BECAUSE of us! We are not some creation out of an invisible force’s boredom or loneliness. Indeed, the fact that the quantum discoveries show we can use our connectedness consciously hands us the key to open the door to the same power that drives the whole universe/multiverse. Let that sink in for a moment. Put another way, because of our direct connection to inner and outer space, our oneness living inside you, me, and every single being on this planet, we have a direct line…no, we are a vital part of the same force that creates everything from atoms to the DNA of existence itself. Therefore, in ways that we are only now realizing, we find that not only are we inseparable with all life and human beings, and what we see, but also with everything that has ever been, as well as things which are yet to happen! Do you need a moment to fathom that? Do you understand that what we are experiencing now is the result of events that have already occurred in a realm of the multiverse we cannot even see? Yes indeed, these are the discoveries over the last 2-3 years in quantum physics. The ramifications of these discoveries are huge, and undermine so many centuries of tradition, myth, and legend. As the evidence mounts and the quantum discoveries continue, all of mankind will finally be forced to toss out the Medieval Dark Age paradigms once and for all. The telegraph and Geocentric model will no longer serve, if you will, any purpose for our modern needs. Hence, the defunct orthodoxy of the nature of existence: who we are, what we are, what we need for the “beyond” will finally, and long over due, be matched with reality and how the multiverse/universe and creation truly function. What an awe-inspiring exciting future that holds for ALL OF US….not just a “special” few. Like it or not, you, me, and every single soul on this earth are intimately connected; not all separate, exclusive, or élite. I dare say the only difference is our freedom of creativity, ingenuity, and altruistic philanthropy to “spread the wealth” of true existence. We are very much connected. What a wonderful breath of fresh air this is! I will attempt to put in simple terms (from my blog Connectivity — Part 2) what Quantum Superposition, Entanglement, and Bose-Einstein Condensates mean to the average person on the streets. At least that is my hope. My apologies if I am unsuccessful, but in my brain and soul what is taking place in the fields of paranormal investigations within law-enforcement, as well as research by investigators at haunted locations around the world, the gap between Quantum Field physicists and their remarkable discoveries, and that of common “ghost” investigators…is closing with every passing year. This is most exciting! What pleases me more is that it is being done without religious orthodoxy — indeed it cannot be done within the confines of traditional religious orthodoxy. Creativity and discovery — one of mankind’s most powerful gifts — cannot be realized when a system of conformity forbids it. Breaking free from centuries of stifling religious chains-of-superstition, Nobel Prize scientists and research are making exciting progress! Indeed, they are unlocking The Nature of the Universe! Through these following short videos I will point out one spectrum of uniformity — in Quantum Mechanics called the Unified Field — that is not visible to our naked eye, but is quite real nonetheless. Sub-atomic particles can never be destroyed or reduced into nothingness according to the classical Law of Conservation of Matter. Objects merely change form after certain chemical or nuclear reactions in a closed or sealed air-tight system. From the studies of modern chemistry and physics came nuclear physics: the nature, interaction, and building blocks of atomic nuclei. Beginning at the nuclear and atomic levels, scientists have developed laws and theories explaining why and how the nature of life behaves. The two videos you just watched showed that by some seemingly invisible force, particles moved or joined into intelligent symmetrical and elliptical shapes based on the intensity or energy created. It is well-known how easily electric currents travel through water. Sound travels through water the same way. What is probably less understood is how any type of energy transports from one point to another. But first, what is going on with sound? Sound is a mechanical wave form resulting from disturbed atomic particles vibrating back and forth within some type of solid, liquid, or gas medium. The human ear can audibly detect these waves only within a specific frequency range of 20 Hz – 20,000 Hz (pitch resolution), also determined by intensity (expressed in decibel), and atmospheric pressure (expressed in vibrations of one-tenth of an atomic diameter). Frequencies below 20 Hz are usually felt and not heard if the number of disturbed atomic particles are large enough (amplitude). Frequencies above 20,000 Hz can sometimes be detected by infants, toddlers, or young children due to their youthful uncontaminated eardrums. Much of what we perceive through our senses, e.g. sight, sound, touch, even smell, is vibrational movement or disturbance that our senses capture. Even though our ears and eyes are very sensitive to nature’s waveforms, we actually perceive a very tiny range of the full spectrum of known vibrations; or that is to say, the full range of disturbances in atomic particles generated by forces of energy. 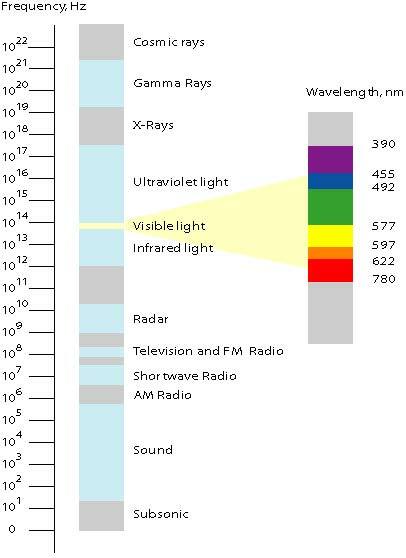 Light travels on the electromagnetic spectrum; a much larger range of frequencies (see Frequency Chart) than our sound range. As you can see in the Frequency Chart, our senses are only able to perceive vibrations between 34,000 and 64,000 waves to the inch. Detecting other vibrations outside this range requires special high-tech equipment like FLIR cameras (Forward Looking InfraRed) or electromagnetic indicators (e.g. EMF detector) that are capable of taking us and our perceived world and glimpse the Aetheric world. But are machines the only means into the aetheric? Was there an aetheric vibrating world in existence prior to our technological advances? Have vibrational disturbances through mediums such as solids, liquids, and gases, even vacuums been taking place all along on higher and lower frequencies our eyes, ears, skin, and noses are not attuned to? Nuclear physics and Quantum mechanics are showing compellingly that the entire Universe is indeed one massive medium with vibrations going on simultaneously (Entanglement) on all frequencies all the time. On the subatomic level, electrons, protons, and neutrons are constantly interacting. Some repel each other, some attract each other to form a new molecule, and some coexist. And the space between these interacting or disturbed particles is on a 10 to the minus 8 centimeters scale; plenty of space for wild interactions! These nonstop interactions are taking place now, even between objects, and have done so since the birth of the Universe. Our human bodies exist in only one small part of the true full spectrum of Inner space (the nuclear level) and Outer space. But every bit of it connects. With that said, what does it also say about the potential of our human brain? Or better yet, what does it mean for a soul? The following video clip Through the Wormhole with Morgan Freeman, airing on the Science Channel, explains how our thoughts influence our immediate space around us and into the eternal memory bank of the Universe. The third video clip postulated water having memory. If that is true as Quantum science is supporting, what does it imply about the air around us as shown in the first two video clips? And given that no nuclear particle is ever completely destroyed into nothingness, how does a perpetual infinite memory bank impact those around us? On other frequencies beyond our very limited powers of observation, how much is seen or not seen, and remembered, forever? What if even our most secret thoughts were secret in illusion only, but available to anyone at anytime, including as it is happening? That approaches pre-detection or recognitions doesn’t it? That is essentially what Quantum physicists call Superposition…as I understand it. Since vibrations cause movement, and on the atomic and nuclear scales movement causes energy and temperatures, now is good time to explain Bose-Einstein Condensates. Most of us know that when certain gas molecules join together forming a liquid, it is called condensation. For example with a frosted mug placed on the table, eventually a wet ring forms at the base; it happens because energy in the surrounding warm air is lost. Gases are very excited energized atoms. 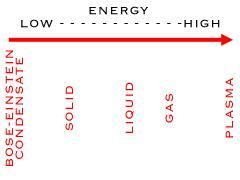 Liquids are less energized and solids are the least energized with only electronic movement within the atoms. Bose-Einstein Condensates represent the congealing of very cold atomic particles right before absolute zero (Kelvin scale) stops everything; or that is to say a group of atoms take up the same space with all the same qualities forming a super atom. It may still seem abstract at this point but what modern physics has revealed is that beyond our classical Newtonian-Empedoclesian laws of nature, those laws completely collapse on the atomic and subatomic levels. Over that threshold an entirely different world of laws exist. And don’t be too hasty to slap a catch-all title to that Aether world. When I say the ancient laws of nature completely collapse, included are most of the ancient myths of all the world’s religions. What has our return to physics class told us? In the brief time that I have probably crudely explained over this post and the previous two posts on Connectivity, one point needs understanding: our human body, our brain, our soul are very much connected not only with our immediate surroundings but equally so with this planet, everyone on it, and this Universe. Space or time does not separate our existence from anyone or anything. Think about that for a moment. Before moving on to my next blog on Connectivity — The New Paradigm, the following video clip can perhaps put everything in a more understandable framework. It is from the 2004 series What the Bleep Do We Know – Down the Rabbit Hole. To continue to the next post of the series, click Connectivity — The New Paradigm .